I had been experiencing difficulties with wind noise on my bike for quite some time which, with hindsight, is actually quite worrying. I would come home from rides after being out all day, get into bed and I would still be able to hear it ringing in my ears. I was unknowingly dismissing a very clear sign that I had been permanently damaging my ears for a while! When I thought of wearing ear plugs on my bike, I imagined I wouldn’t be able to hear anything, which is why I hadn’t considered wearing plugs. With the ‘Auritech Biker’ ear protection I can still hear my Yamaha MT07 with its loud Akrapovic exhaust, it's just toned down a little. Weirdly enough, I actually feel more in tune with the bike. The wind noise is reduced massively which improves my focus. I never once thought ear plugs would have this effect, but they do and it's so much better, plus I'm not damaging my ears and I feel more focused. I can have conversations with my friends at the traffic lights clearly and I could even hear children having a conversation at the side of the road! Intercoms are actually easier to hear because of the reduced wind noise as well. All the important stuff I was worried about not being able to hear, I can, sometimes I even hear clearer! I did struggle a little to put them in at first but that's because I had never used any before. I wasn't sure on the technique or how to put them in, but the key I found was to twist them in. I found that worked well for me and they don't tend to move or come out while on the go. To buy a set of ‘Auritech Biker’ ear protection, click the link here Auritech Biker Earplugs. Charlene — or ‘Chaz’ as she is known to her legion of followers — is an influential motorcyclist from Manchester. 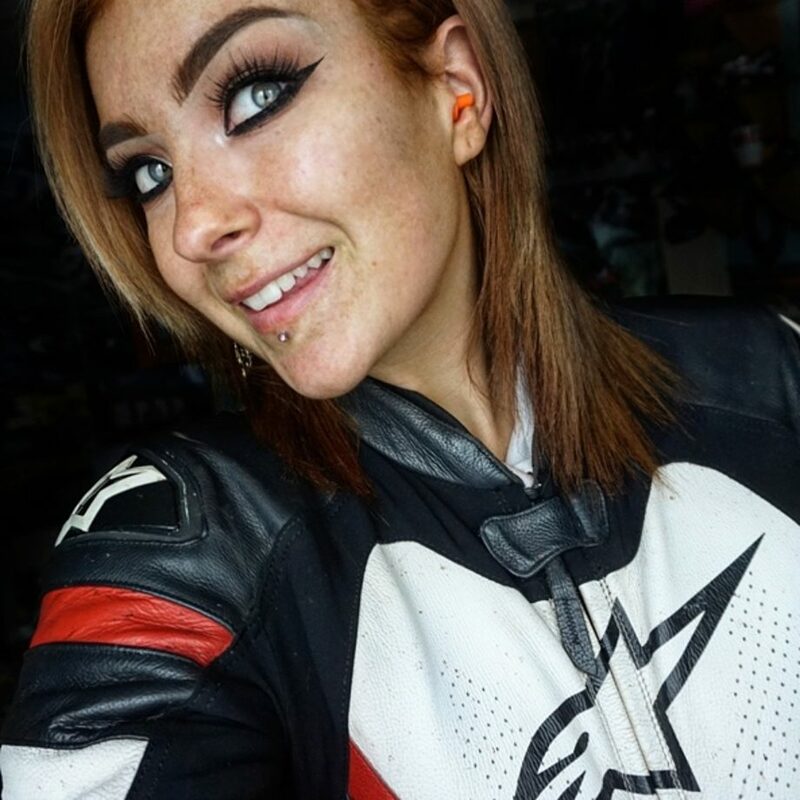 Chaz doesn’t just ‘live the motorcycling life’ on Instagram, she breathes it for real. Come rain or shine Chaz commutes to work every day on her Yamaha MT07 that has a rather loud Akrapovic exhaust system. When she isn’t working the day job in the Automotive industry, Chaz joins her other half in the road racing paddock. Mike Norbury is an up and coming road racer that battles it out with the best of them at the North West 200 and IOMTT to name a few. Whether it be a rainy Monday morning commute, a Bank Holiday blast or pushing a race bike through a muddy and wet field in Northern Ireland, Chaz is there no matter what. So as you can see Chaz’s life is totally immersed in motorcycles, and she wouldn’t have it any other way.